This paper addresses Coppel (2012)’s claim regarding the heterogeneity of the identity of the Chinese Overseas. 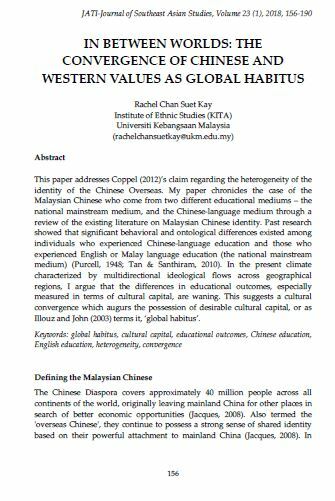 My paper chronicles the case of the Malaysian Chinese who come from two different educational mediums – the national mainstream medium, and the Chinese-language medium through a review of the existing literature on Malaysian Chinese identity. Past research showed that significant behavioral and ontological differences existed among individuals who experienced Chinese-language education and those who experienced English or Malay language education (the national mainstream medium) (Purcell, 1948; Tan & Santhiram, 2010). In the present climate characterized by multidirectional ideological flows across geographical regions, I argue that the differences in educational outcomes, especially measured in terms of cultural capital, are waning. This suggests a cultural convergence which augurs the possession of desirable cultural capital, or as Illouz and John (2003) terms it, ‘global habitus’. CHAN SUET KAY, Rachel. IN BETWEEN WORLDS: THE CONVERGENCE OF CHINESE AND WESTERN VALUES AS GLOBAL HABITUS. JATI - JOURNAL OF SOUTHEAST ASIAN STUDIES, [S.l. ], v. 23, n. 1, p. 156 -190, june 2018. ISSN 2600-8653. Available at: <https://jati.um.edu.my/article/view/12191>. Date accessed: 26 apr. 2019. doi: https://doi.org/10.22452/jati.vol23no1.8.